– A variety of roles depending on the scene I need to act out. – A variety of rolls depending on how large they’re baked. – The chicken suit I’ll be wearing at my next job if anyone finds out these are the “notes” I’ve been taking during meetings. – Something sexier if you’d like. – The urge to write “Your mom” in all caps is very strong. Apparently I’m still 14 and this sort of thing is funny. – Large freezers, but let’s not try this one out okay? – Photos that taken from at least several feet away. – Footwear in my size. – Public ball pits, although nobody will let me. – The confines of society. Well, long enough to excel at a job interview anyway. 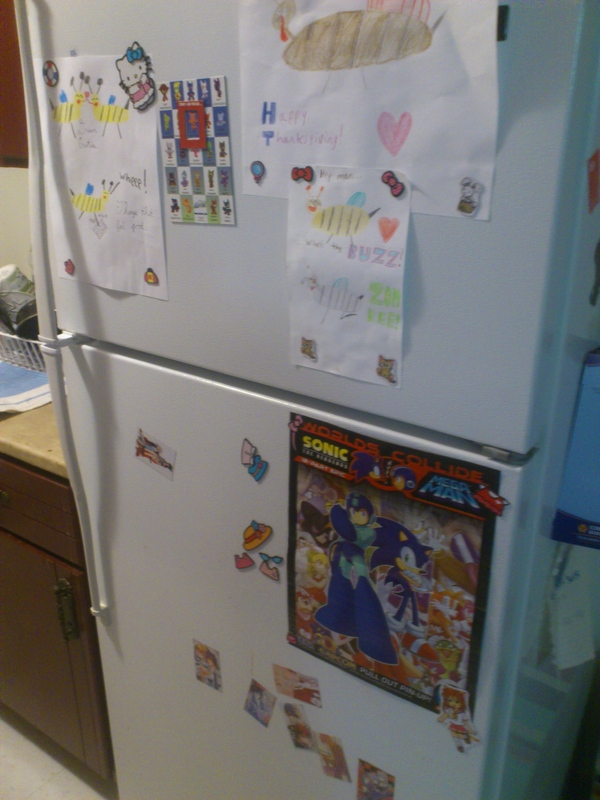 I gotta fill up the rest of our fridge door. Hmmm . . . This entry was posted in Bees!, Blog, Blogging and tagged 2013, Art, humor, kitchen, list, picture, things, writing. Bookmark the permalink.